No one knows exactly when the word "internet" was first used. 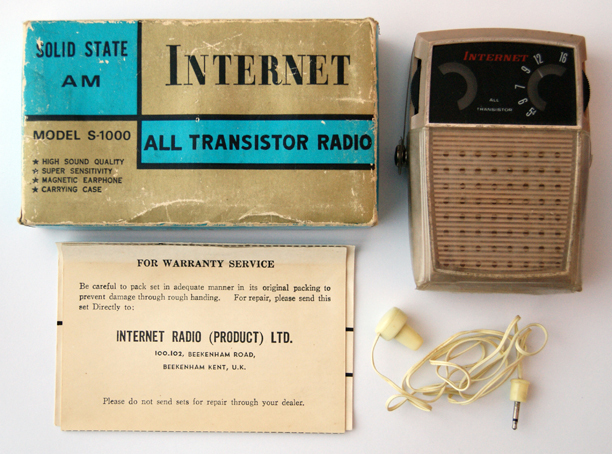 One of its early (50s) and curious usage was as a brand name for a transistor radio : "Internet Radio" Model S-1000". Today, radio is far from being the ultimate information and entertainment medium. Moreover we have much more pragmatic and even dismissal attitude towards radio as technology. It’s far less powerful and ubiquitous communication tool than internet, it’s cruelly lacking interactivity and feedback. Interesting enough that most of radio streams are getting digitized and distributed via internet. But what’s still particular about the radio is its formidable capacity by sound only to create a sense of proximity and a very intimate and immersive listening experience. Think about listening to the radio in your car on your way to work - you get a sense of information delivered to you particularly, the radio presentators speaking to you directly, you catch yourself taking part in discussions and debates. In other words, you are immersed in experience, totally auditory experience. The internet, for most part, is a reading medium. So what I was interested in is recreating this the auditory experience that enables the sense of proximity and immediacy but with internet textual data. That’s where the radio methaphor comes in play : the project takes physical form of an old transistor radio and on surface keeps its function - diffusing a sound stream. 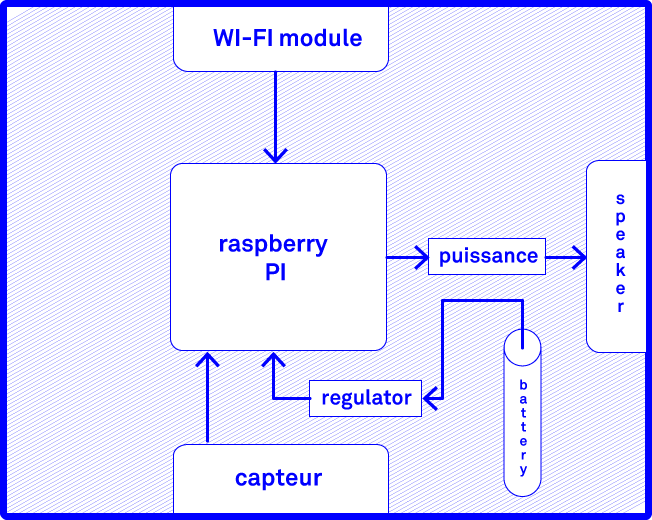 But the "insides" of the radio are replaced with Raspberry Pi connected by wifi to internet and dotted with presence sensor. The python script collects tweets containing "I have a dream..." phrase and transforms it into texttospeach stream. This stream is not audible until the radio "senses" a presence. If there is anyone near, radio starts diffusing the stream, which volume depends on the distance of the listener - closer she is to the radio, the louder the sound is. This is an ideal scenario when a listener is one to one with the audio source, so that the dream tweet stream is addressed personally to him in a sort of "confession" stream. Which is only to highlight the dichtomy of private/public relathionship of digital media : these messages intended public are being rendered "intimate". 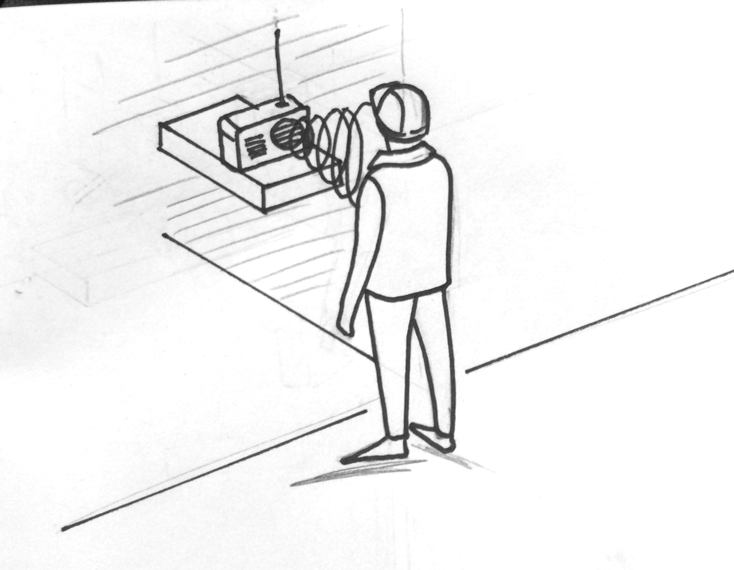 The second possible scenario is a sort of "auditory voyeirisme", when other listeners are gathered behind the first one. In which case other listeners are getting access to the stream enabled by one, thus disrupting the intimacy of her stream-to-listener relationship. This is a brief outline of the project. The project is really at the starting point. Hope that step by step it’ll take its form.